Mangakarau was once a hive of different industries - flax processing, timber felling and coal mining and not far away abortive gold mining enterprises ripped through the bush. But the swamp somehow survived and was never successfully drained. Mangarakau was once a tall, dense lowland rain forest dominated by Kahikatea and Puketea. On the low ridges, a forest of Rimu, Matai, Totara and Miro stood. Prized by Maori as a food source the wetland once teemed with birds, whitebait and eels. At its peak the village had 20 dwellings. 'The swamp has survived to this day because it has defied every attempt made in the last 150 years to drain it. Mangarakau was considered by early European settlers as an impediment to the access they wanted to the goldfields, timber, flax beds and coal mines of the locality, and a source of little more than eels and mosquitoes. Unable to drain it, they had to work around it. A few traces remain of their endeavors and settlements, but the wetland remains in all its glory, one of only 10% of our wetlands that have survived in all of New Zealand' (http://www.gbworkcentre.org.nz/mangarakauswamp/introduction.html). Mangarakau flax mill workersat play with sheaf of flax in foreground. (c.1890s Tyree Studio - Photo of photo in Mangakarau Community Centre). Flax/harakeke was an amazingly versatile plant in the right hands. Maori made warm clothing, fishing line and rope from the processed flax - the leaves were scraped with a mussel shell. The raw leaves were used to make baskets and floor mats. The gum healed wounds and the boiled roots made a disinfectant. There were two flax booms in New Zealand, both associated with shortages of manila fibre. The first was in the 1860s and the second in the 1880-90s. The latter one was, 'due a shortage of manila fibre [in 1888 that] coincided with a demand for binder twine in the United States of America'. Prices for New Zealand flax rose to over £35 per ton on British and American markets. With the cost of production averaging between £15 and £20 per ton, flax milling be­came an attractive proposition for many businessmen and mills began to spring up wherever an adequate supply of green leaf and good transport facilities were available (see Foxton Flax Town 1888-1988). Flax mill workers in Mangakarau - flax sheaves in background and man third from left festooned in shank of processed flax (c. 1890s Tyree Studio - Photo of photo in Community Centre). Most flax-milling operations were relatively short-lived and very price dependent. 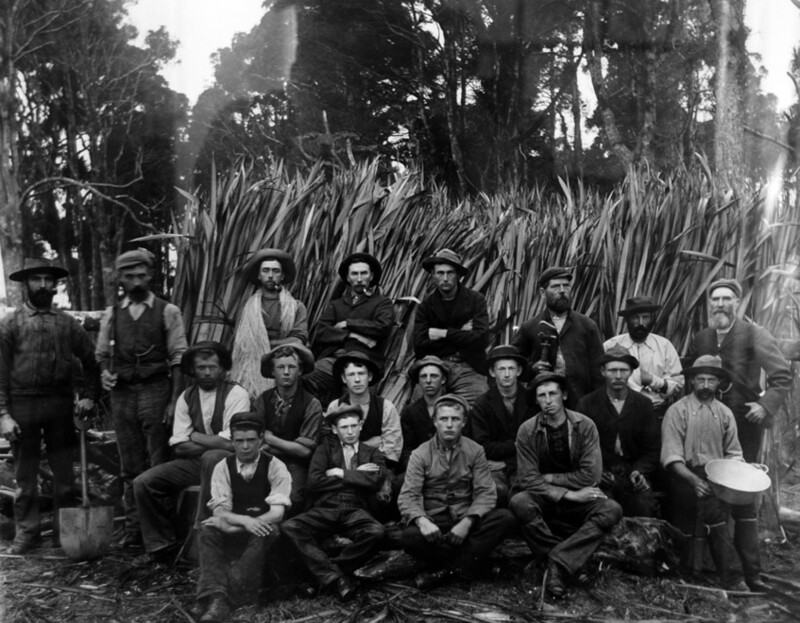 Initially based on Maori hand labour the industry was revolutionised by the invention of a flax 'stripper' in 1867 that eventually could produce 15 hundredweight (1,620lbs) of flax a day. Flax was used for cordage and twine and was exported chiefly to the UK, the US and Australia. A third boom occurred in 1898 in the Spanish-American war which resulted in the US seizure of the Philippines. The war led to a renewed shortage of manila fibre. Prouse and Saunders Flax Mill, Paturau River (Tyree Studios - taken from display at Aorere Centre, Collingwood). 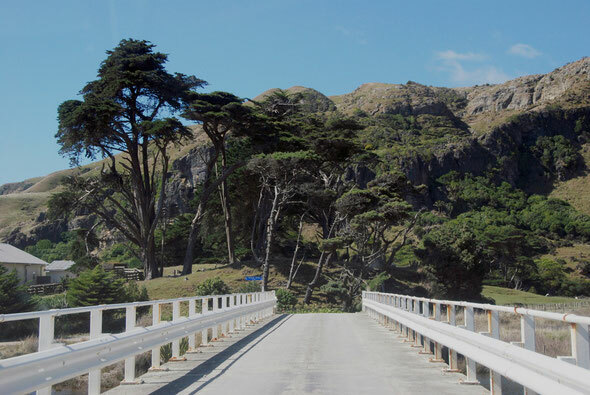 There is still a 'Prouse Road' at the mouth of the Paturau River. and transport links in order to reach export markets. An unidentified worker spreads hanks of fibre in drying paddocks in Foxton/Flax Town in Manawatu-Wanganui. The hanks of fibre are first dried on the ground and then hung over wire fences in background (Foxton Historical Society). The Prouse and Saunders mill at the mouth of the Paturau River was not opened until 1903 although a scattering of mills had operated in the Collingwood area from the 1840s. A two and half foot narrow-gauge tramway was laid down for moving flax and timber. The mill both provided employment for pakeha and Maori and also cleared farmland in the more fertile bottom land. The last mill was still operating in the 1940s producing woolsacks for government contracts. The flax came from near Wharariki (see Aorere Centre, Collingwood). The Mangakarau flax mill in the early 1900s. Hanks of processed flax were baled up and shipped out to export markets from West Whangaui Inlet (Tyree Studio, Nelson Provincial Museum). Update January 2015: 'There was a bit of a revival in the industry at the time of WW2 because our armed forces needed rope - as a child I can remember the drying racks still in place on several farms, and later on worked on a property that had big sealed tanks where the flax was steeped before processing....it was the local WW2 Factory and Government owned' from a correspondent living near Blenheim. 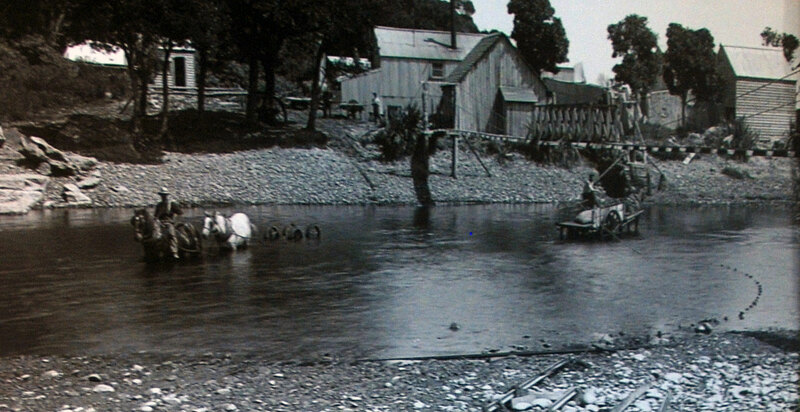 Gold mining in Golden Bay was short lived after the first discovery in 1856 but the name 'Golden Bay' stuck. Alluvial deposits were worked between Collingwood and Takaka but the Otago and West Coast rushes lured the diggers away. In the latter part of the 19th century three companies were established to win gold from quartz reefs and gravels. These used prodigious amounts of timber to construct sluices from man-made reservoirs for their sluicing and crushing operations but despite the large investments little gold was won. 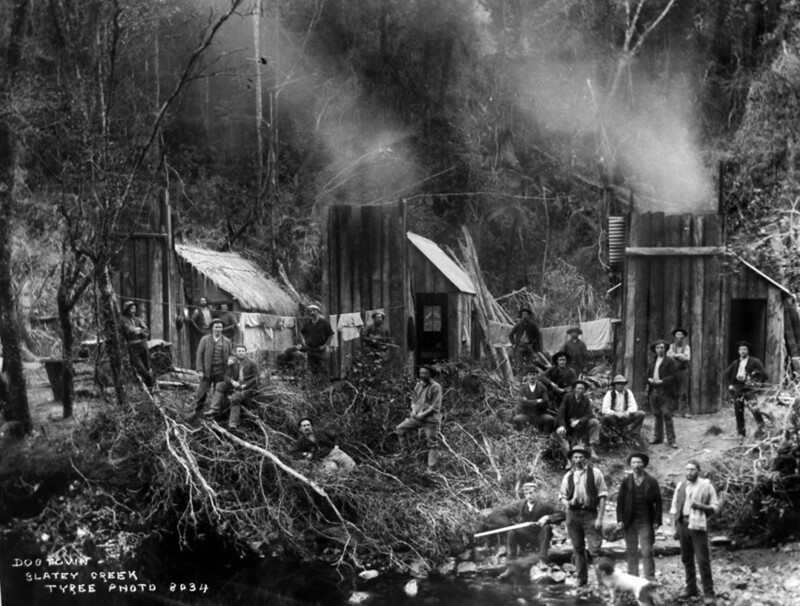 The photo above shows the laborious pre-mechanized sawing techniques employed in the goldfields (see The Prow: Aorere Gold). 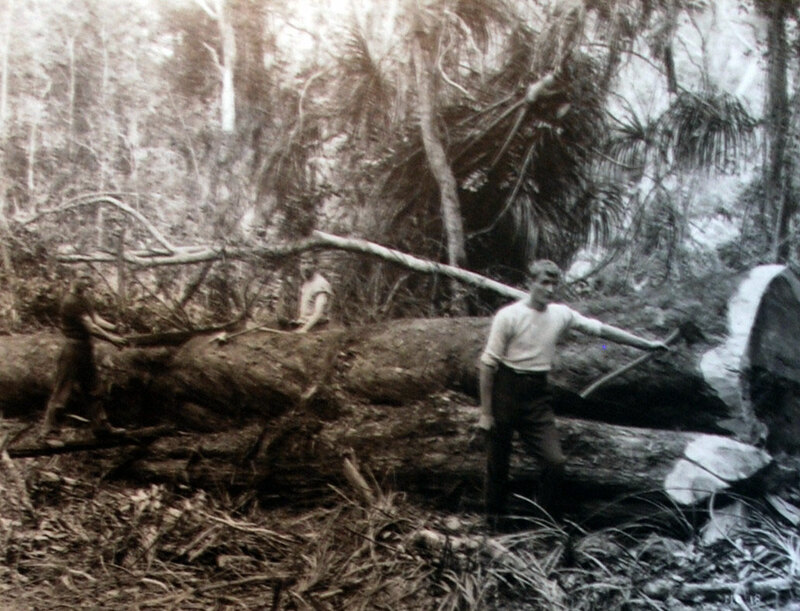 Men (probably tree fellers) in the bush at Dogtown, Slaty Creek, Taitapu. They stand by a river bed next to three small dwellings. (c.1890s Tyree Studio - Photo of photo in Mangakarau Community Centre). Drift coal mining was active in Western Golden Bay for over a hundred years. 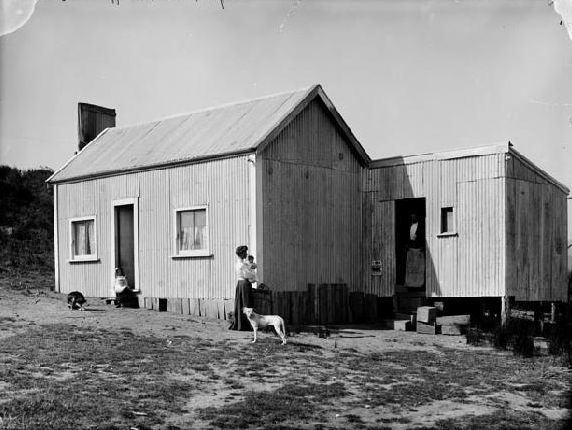 The Mangakarau mine - established in 1866 as the West Whanganui Coal Company - was one of the last survivors and was still supplying coal for domestic and local industrial use in the 1950s. Coal was shipped from wharves in Whanganui Inlet until better roads allowed it to be trucked out. The timber industry based on small-scale mills around Collingwood and Mangakarau provided longer-term if arduous and dangerous employment. In 1909 Prouse and Saunders started a sawmill at Mangarakau. It closed down by 1920 as the IWW depleted supplies of willing workers. It reopened as the Benara Mill in 1932 and leased logging rights over 16,000 acres of land. Lumber was shipped from wharves in the inlet to feed growing demand for construction from Nelson to the east (Friends of Managakarau). 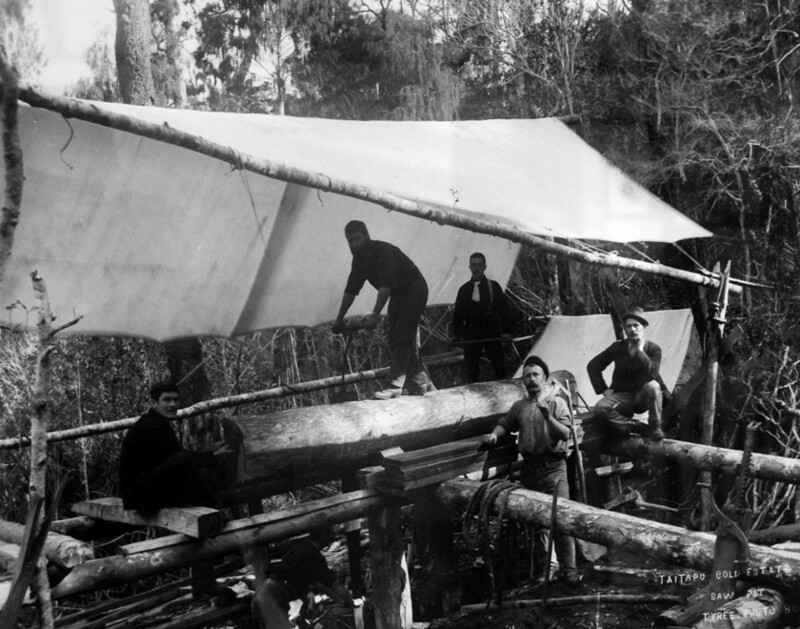 Lumber operations for the Prouse and Sanders Mill at Mangarakau. 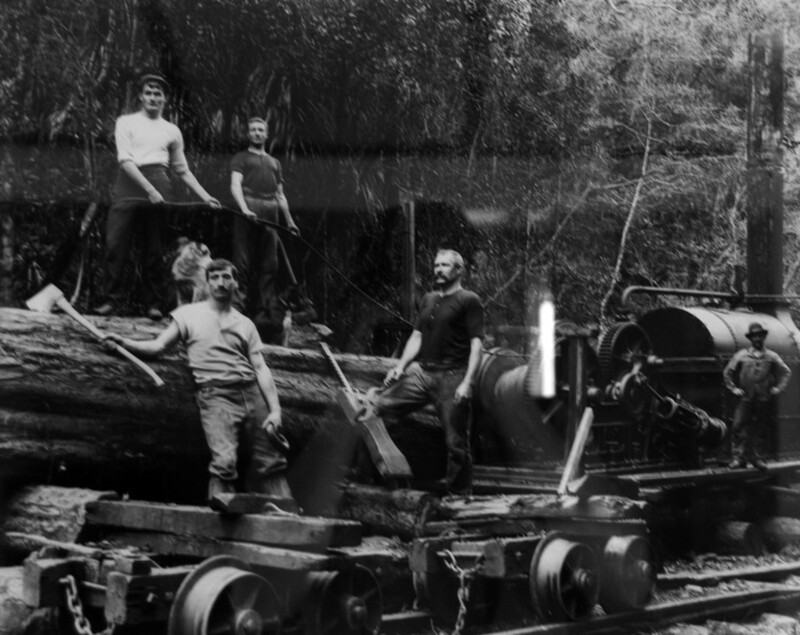 The photo gives an indication of the bonanza of timber in the native forests of the area (from Aotere Centre display). I wondered, looking at the carefully posed black and white photos taken by the Tyree Studio photographers in the 1880s and 1890s, what the bush communities at Mangakarau were like. Harsh, comradely, entirely male? Hopeful, enthusiastic at their new land for they seem to be entirely pakeha (European/white settlers)? Egalitarian and blokeish? Basic but decent? But it was hardly a primitive socialist Utopia. These are photos of workers and there is enough evidence to suggest that someone else owned the capital to put these enterprises together. These are proud backcountry men and boys. They've hardly struck it rich but many must have hoped that the land they were clearing might be theirs or that enough accumulated wages would buy a little corner of God's Own Country; a country that was on the cusp of discovering it could send refrigerated meat to Britain and thus revolutionise New Zealand agriculture and landholding with it. The bush camps were soon to disappear as boys and men flooded to enlist in the Australian and New Zealand Army Corps desperate to show the British Empire that they would heed the call and could be counted upon to fight 'The Bosch'. Little did they know that it was to peculiar horrors of Gallipoli that most of them would be sent. "People would come from as far as Collingwood. They liked our hospitality. 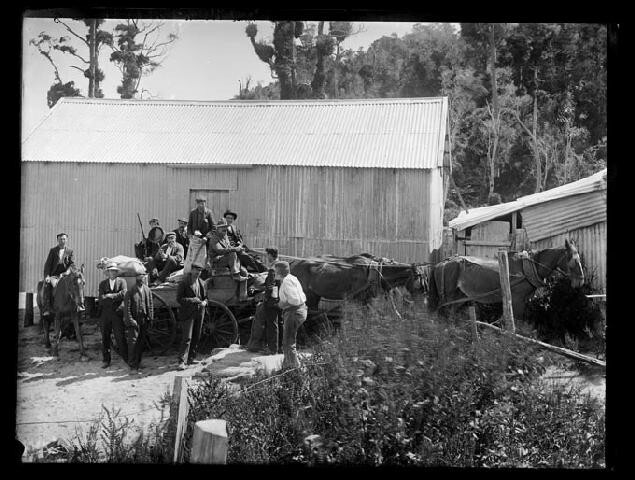 People working at the timber mill and coal mine at Mangarakau earned quite good money and were able to afford the simple things: two to three 18 gallon kegs of beer, a case or two of Rochdale cider for the ladies and saveloys. Somebody played the piano for dancing or singing." 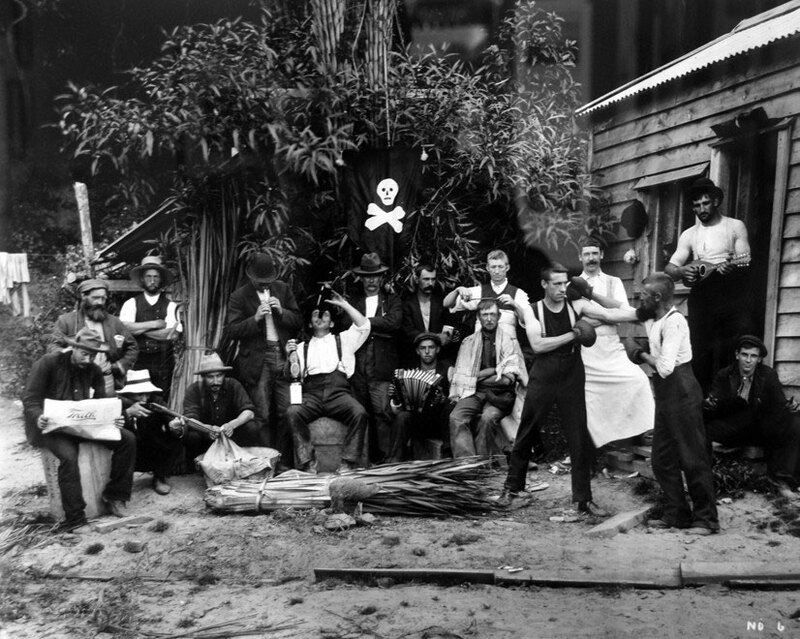 The area even had its own rugby team, the Paturau Pirates (The Prow: Paturau).